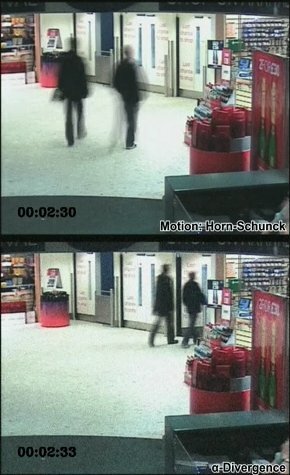 Analysing surveillance video footage often includes watching the video in fast-forward mode. Additionally, the question arises how the accelerated videos should be shown best. Here, the video visualization should allow for good object identification as well as good motion perception. Moreover, adapting the video playback speed according to its content requires to communicate the current playback velocity. 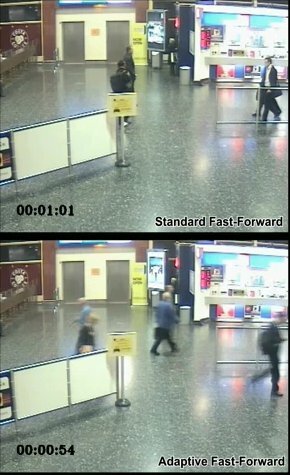 This page includes the supplementary material for the paper "Learning a Visual Attention Model for Adaptive Fast-Forward in Video Surveillance" and "Information-Based Adaptive Fast-Forward for Visual Surveillance", which are methods for adapting the playback speed in video, and "Evaluation of Fast-Forward Video Visualization", which introduces and evaluates four video fast-forward visualizations and three adaptive fast-forward playback speed visualizations. Höferlin, Markus; Kurzhals, Kuno; Höferlin, Benjamin; Heidemann, Gunther; Weiskopf, Daniel: Evaluation of Fast-Forward Video Visualization. In: IEEE Transactions on Visualization and Computer Graphics: Ausgabe 18, Nr. 12 (2012), S. 2095-2103. 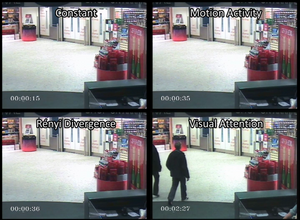 Höferlin, Benjamin; Pflüger, Hermann; Höferlin, Markus; Heidemann, Gunther; Weiskopf, Daniel: Learning a Visual Attention Model for Adaptive Fast-Forward in Video Surveillance. In: In Proceedings of International Conference on Pattern Recognition Applications and Methods (ICPRAM), S. 25-32, 2012. 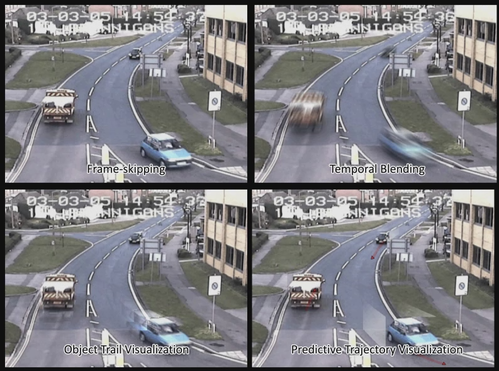 Höferlin, Benjamin; Höferlin, Markus; Weiskopf, Daniel; Heidemann, Gunther: Information-Based Adaptive Fast-Forward for Visual Surveillance. In: Multimedia Tools and Applications: Ausgabe 55, Nr. 1 (2011), S. 127-150. Comparison between conventional fast-forward, and adaptive fast-forward based on motion activity, rényi divergence, and visual attention model on the Crowded Airport Sequence. The conventional approach accelerates the video to a constant playback speed and discards the frames in between, while the adaptive approaches dynamically accelerate the sequence according to their relevance measure. The video sequence is averagely accelerated by factor 3. 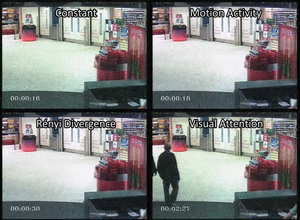 Comparison between conventional fast-forward, and adaptive fast-forward based on motion activity, rényi divergence, and visual attention model on the Airport Sequence. The conventional approach accelerates the video to a constant playback speed and discards the frames in between, while the adaptive approaches dynamically accelerate the sequence according to their relevance measure. The video sequence is averagely accelerated by factor 5. 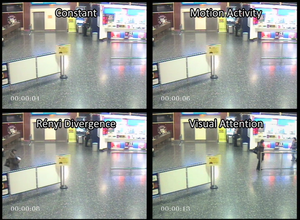 Comparison between conventional fast-forward, and adaptive fast-forward based on motion activity, rényi divergence, and visual attention model on the Noisy Airport Sequence. The conventional approach accelerates the video to a constant playback speed and discards the frames in between, while the adaptive approaches dynamically accelerate the sequence according to their relevance measure. The video sequence is averagely accelerated by factor 5. 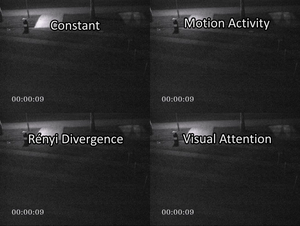 Comparison between conventional fast-forward, and adaptive fast-forward based on motion activity, rényi divergence, and visual attention model on the Night Sequence. The conventional approach accelerates the video to a constant playback speed and discards the frames in between, while the adaptive approaches dynamically accelerate the sequence according to their relevance measure. The video sequence is averagely accelerated by factor 10. Comparison of standard fast-forward and our approach on the Airport Sequence. The conventional approach accelerates the video to a constant playback speed and discards the frames in between. Our approach dynamically accelerates the sequence according to the information gain and blends frames based on the physiological model. The video sequence is averagely accelerated by factor 5. Comparison of two different adaptive fast-forward approaches on the Noisy Airport Sequence. The first is depending on Horn-Schunck motion magnitude, the second is the proposed information-theoretic approach. In contrast to motion measure, the proposed information-based approach is robust to noise and leads to good results. The video sequence was averagely accelerated by factor 10. 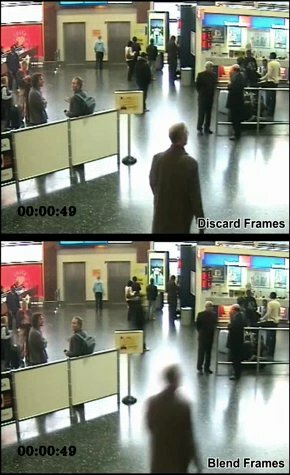 Comparison of standard video fast-forward visualization (discard frames) and our physiologically motivated blending approach on the Airport Sequence. The video sequence is averagely accelerated by factor 7.